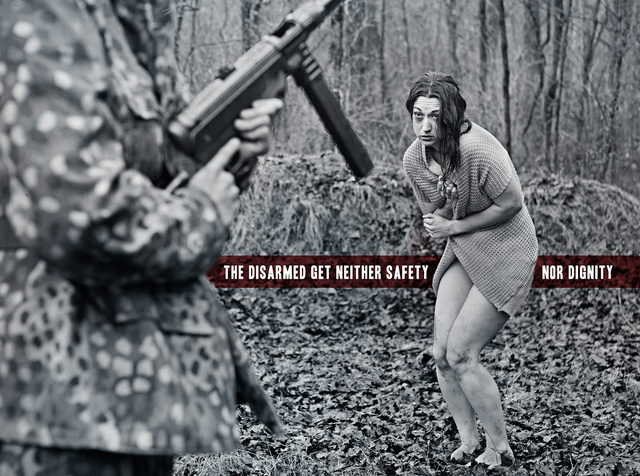 Being armed does not guarantee either safety or victory, but being unarmed by choice or disarmed by lies, coercion or custom pretty much guarantees eventual ruin or dependency. The options are then limited to extinction like the dodo or essentially turning into livestock like the chicken, to be used or used up at the whim of the armed thugs or government. Nowhere in this range of choice is living with dignity, free to choose the course of thought and action. While thoughts may be free, the slightest manifestation of them becomes so perilous as to train the habit out of the general population. This entry was posted in rkba, self-defense, weapon and tagged 9x19, civilian, SS, submachine gun, victim, war, WW2. Bookmark the permalink. Another great photo Oleg. This is a point I try to get across whenever I can. History has not been kind to those without the means to defend themselves. There is no virtue in being defenseless. Whenever we see an act of violence and ask “Why?” or “could no one have done something?” Yes, someone could have done something. If they’d have been armed and prepared to defend that which they hold dear. Very well done sir, very well done. Some never learn from History. As per usual, your statement is painfully true. This is why we must never allow it to happen. I have to say that is one of the most powerful images you’ve done yet. And yet the free peoples of the Western world from Australia and UK, to Denmark and Canada, and even into the sacred 2nd Amendment home of America (Connecticut, New Jersey, New York, California) have, over the last 50 years, begun to disarm themselves. There are minor victories for sure, concealed carry laws in many US states have improved, but the general trend in the West is heading in the wrong direction.